With all the food and cooking in my life it was bound to happen – the stomach flu. I spent Tuesday and Wednesday in the bed eating saltines and drinking ginger ale. I was unable eat or even think about food for the majority of the week – including watching any cooking shows, reading my cooking magazines or catching up on all my bookmarked food blogs! It was the weekend before I could think about being hungry and when I started to feel hunger all I wanted was pizza. And since then, I’ve had pizza for four days straight. During my pizza palooza, I started thinking about a pie I ate in Chicago a couple of years ago. At that time, Great Lake’s Mortadella Pizza had just been written up as “The Best Pizza in the America” by GQ Magazine. It was unusually delicious – with uncooked Italian bologna topping a usual margarita pie (with marjoram instead of basil). It was unforgettable and I’ve been itching to attempt a recreation since then. Additionally, I’ve been waiting for the perfect opportunity to test out the double zero flour that I picked up at Giacamo’s Italian Market a couple of months ago. After some online research, I figured out the basic ingredients that Great Lake’s used to make this note worthy pie. I made another trip to Giacamo’s to pick up the other few items. When a recipe has so few ingredients you should really get the best quality ones. And there is no better place in Greensboro to find great Italian foods. I picked up some marinated olives, mushrooms and eggplant slices to snack on while the pizza baked. While this pizza wasn’t exactly how I remembered it (you can’t pick up a wood fired oven at Giacamo’s), it was sure worth the effort. The double zero flour wasn’t anything to write home about. I don’t think it made any difference which is good to know in the future. But without a doubt, this pizza was the star in my pizza palooza. Directions: Make the pizza dough according this recipe. After the dough rises, divide it in half. Put the remainder in the freezer for another time. Preheat the oven to 400 degrees. Place the pizza stone or pan into the oven to heat. Pulse the tomatoes in a food processor until coarsely chopped. Roll out the dough into a large thin round. Once the oven is hot, remove the pan and top with the dough. Drizzle with olive oil, salt and pepper (make sure to add salt to the crust). Add a light layer of tomatoes and top with cheese and garlic. Sprinkle with oregano. Bake until the crust is golden brown, cheese is bubbling and bottom of the crust is crisp. 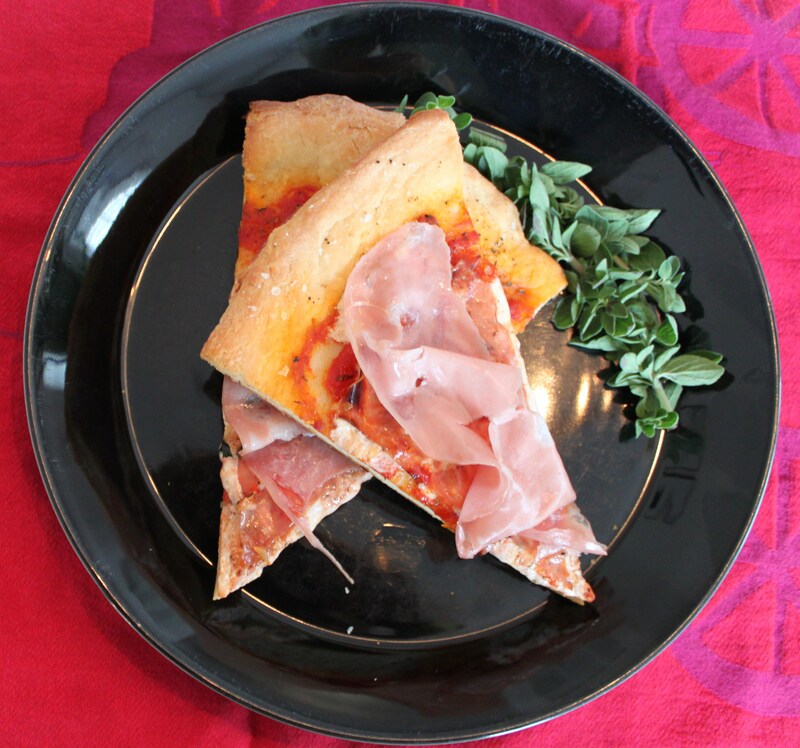 Remove the pizza and immediately top with mortadella. The mortadella will warm and wilt from the residual heat of the pizza. Very Interesting. I cannot imagine what it would taste like. I will have to try it some time.